BetConstruct - A Live Casino Provider with a difference! BetConstruct is an award-winning developer and provider of online and land-based betting and gaming solutions. They are a privately owned company founded in 2003 in Armenia. Their head office is based in the UK and they have offices in Armenia, USA, Malta, Latvia, Peru & South Africa. They employ over 800 staff who serves clients based in Europe, Russia, Central and South Eastern Asia, and Africa with an extensive range of products, back office tools, Sportsbook, white label and turnkey solutions. 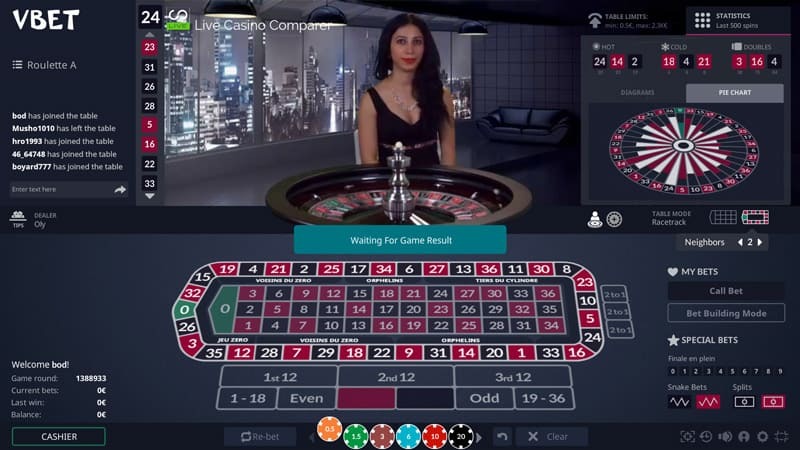 Retail Solutions – Gaming and Betting Software for physical premises. Marketing Solutions – Affiliate, Agent and CRM systems. BetConstruct holds licenses to operate from the UK Gambling Commission and the Alderney Gambling Control Commission and are currently applying for a licence with the Malta Gaming Authority. In terms of this article though I’m interested in just their Live Casino product and that’s what i’ll be discussing here. One of the great things about reviewing live casinos is that I get to test out and investigate all different types of live casino software. If I was just playing I’d probably stick to just Evolution Gamings software, but I’m glad I’m not as I just wouldn’t come across software providers like this. 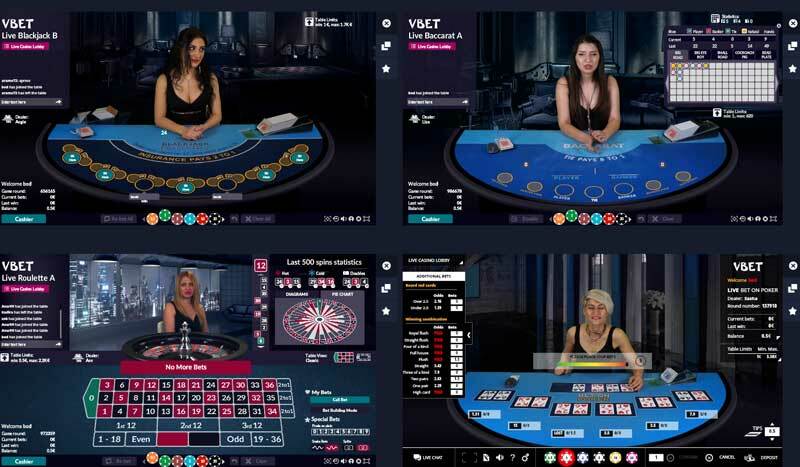 One of the reasons why BetConstruct haven’t been on my playing radar is that they haven’t held a UK gaming License and no casinos have been able to offer their platform to UK players. However that is about to change which is great news as their live casino games have something different to offer players. 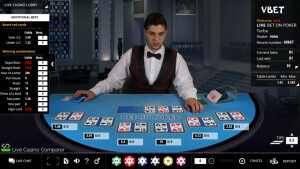 Their Live Casino Studio was built about 2 years ago (2012-2013) and is located in Yerevan, Armenia. I’ve listed below a Live Casino that has their software and the great thing is you can fire it up and load the games and watch what’s happening without needing to register. On the other hand if they accepted me as a player I’d be depositing and playing for the reasons you’ll discover below. Bet on Poker 0.50 – 8k None To see the latest Live Casino promotions. Click Here. Bet on Baccarat 1 – 5k None No Live Casino Bonus. 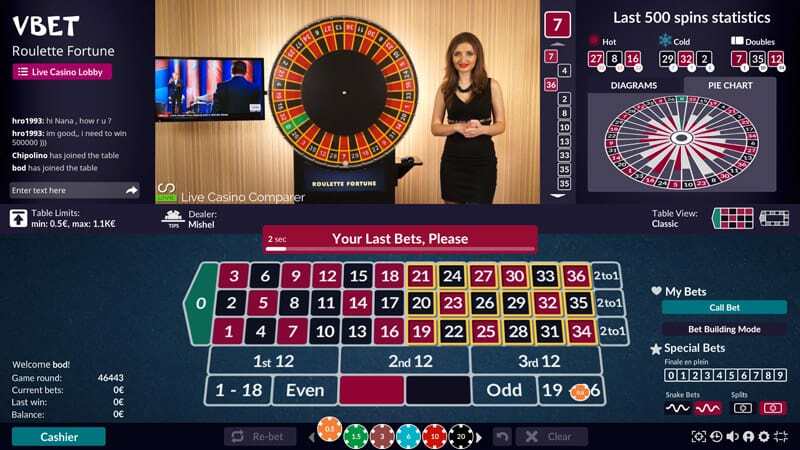 Live Roulette – 3 tables in English, Armenian and Turkish. 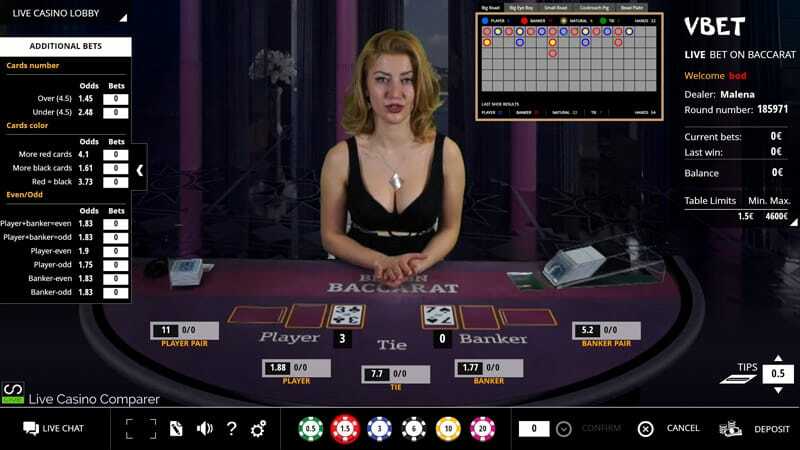 Live Blackjack – 5 tables in English, Russian, Turkish and Armenian. Live Baccarat – 1 table in English. two unique versions of existing classics that allow you to bet on odds that are determined by the house during the course of each hand.! 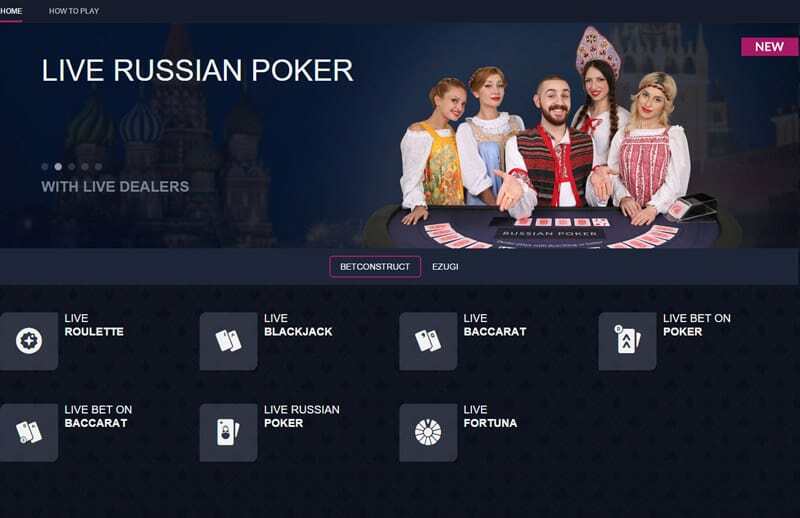 Live Bet On Baccarat – 1 table in Russian. 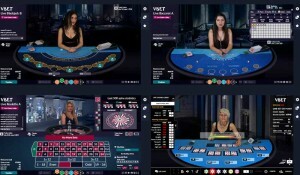 Live Bet On Poker – 1 table in English. 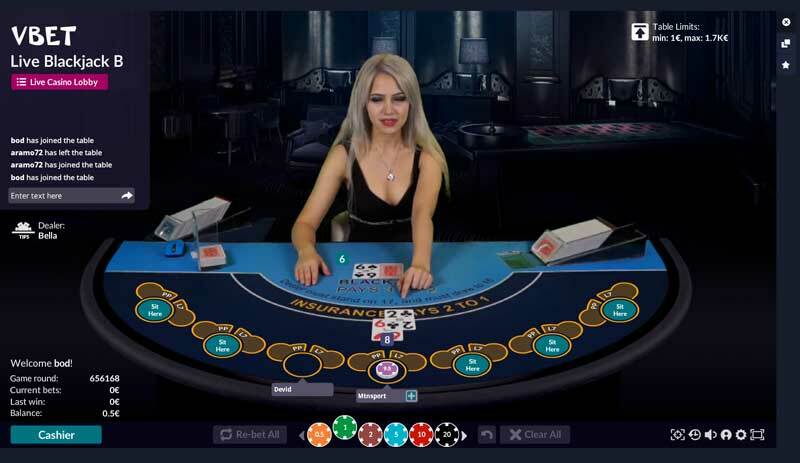 Live Russian Poker – 1 table in Russian. 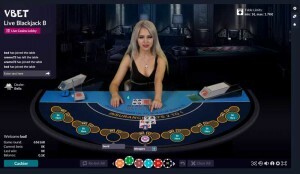 Live Fortuna Roulette – Which is basically normal roulette but with the wheel hung vertically rather than on the horizontal, akin to the Wheel of Fortunes you see in land based casinos. Live Chat with the Dealer. View game in a pop out window. Full help facility with game play information. Access to the lobby and cashier. Only generic tables are currently available. There is a Multi Seat option where you can sit at up to 3 seats. You can surrender your hand for half your stake. You can double on a split. 3 sides bets are available with of choice of two being possible. Pairs, Lucky 7 and Honey Bonus (which is a mixture of the 21-3 poker side bet & suited Blackjack ). Pre-decision option allows you to select your play before it’s your turn. This speeds up the game. 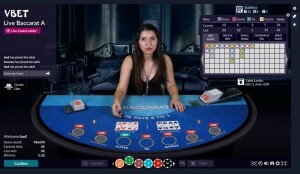 Smart Player – Runs in the background and if you make a decision that is not based on standard strategy you get a warning message and the option to undo the action. Special blended table layout (Classic + Racetrack). Statistics for the last 500 spins are shown with details of hot / cold numbers. Special bets – neighbours, Final, Snake and splits. Two viewing angles (Front & Top). A bet building feature to enable complex bets to be built away from the game and then applied during the betting window. Played with 6 decks dealt from a manual shoe. 5 road maps can be displayed, Big Road / Big Eye Boy / Small Road/ Cockroach Road & Bead Plate. Bonus side bets of Sum Bonus and Tie Bonus can be played. Multi Player game, i.e. an unlimited number of players bet on the same hand. This is played with 6 decks. Based on the classic Baccarat drawing rules mixed with the ability to place additional bets (for odds as shown) as the cards are drawn. You can bet on Number of cards dealt, the Colour of the cards and on whether the cards will be odd or even for the Banker or Player. There are three betting rounds, before the initial deal, before the Bankers first card is opened & before the Players and Bankers second and if necessary extra cards are opened. Odds are calculated by the software. Pairs side bet is also available. Played with one deck that is manually shuffled by the dealer. Odds are re-calculated after each of the 4 rounds of betting, before the Initial Deal, before the Flop, before the Turn & before the before the River. Multi Player game with 18 betting positions. Russian Poker is a 6 card variant of Oasis poker. 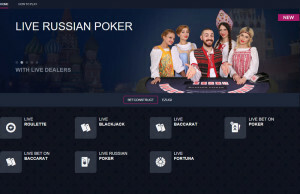 Live Russian Poker is not presently offered by any other live dealer platform. Each player may play on min 1 and max tree boxes. 1 and 3 boxed may be played only “blind”. Player may win with two poker combinations on his hand. “Intelligent player” system helping the player to select Bet or Fold option during the Final decision time. It’s based on the best practice of playing Russian poker. Russian Poker offers also bonus bets, which attract players with very rich pay-outs. (Bonus combination on player hand or bonus combination on dealer hand). 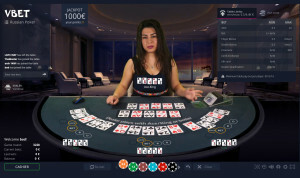 Player may win on his Insurance bet in case the dealer is not qualified and then buy dealer qualification and win on his bet wager as well in the same game round. 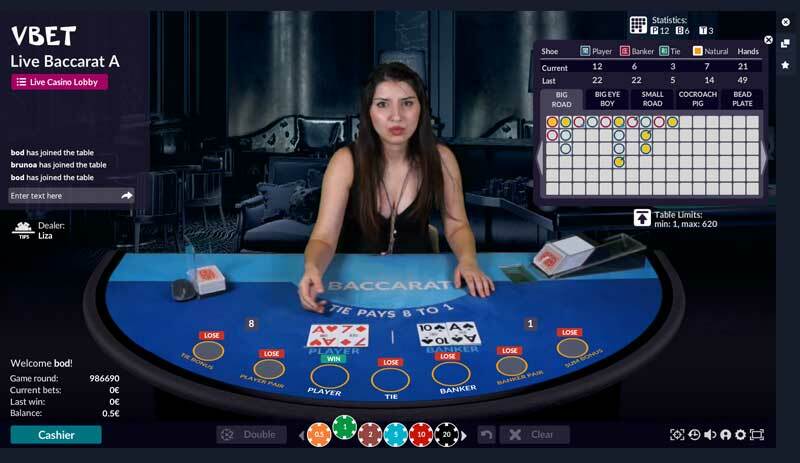 Allows to display up to 4 different Live Casino games or Live Casino games and other casino games including virtual RNG games and slots. The lobby area display the games that can be played. 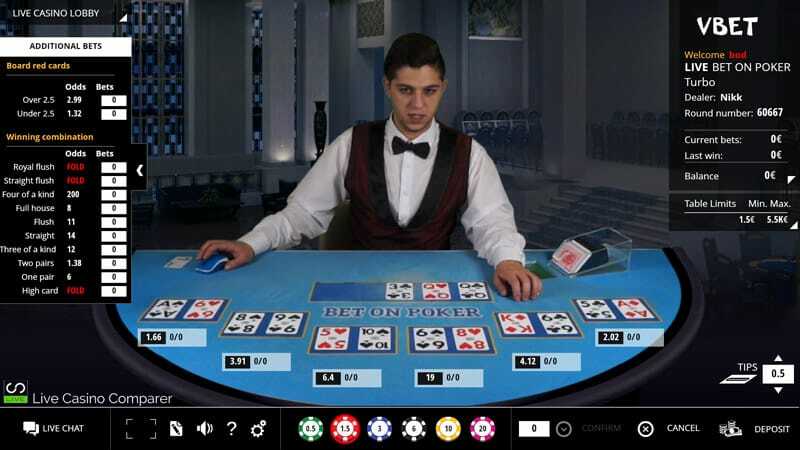 On selecting one of the game you are taken to another menu that displays the tables available and gives details of the dealer and language options on the table. As a player I really like the playing interface and the fact that they offer something different when it comes to side bets in Blackjack. The Bet On games will really appeal to those gamblers out there, but I found that these two games are just too slow to play for any length of time. I suspect that the games have a good margin for the “house” and less so for the player.